A low top edition on the Nike Kyrie 4 silhouette will hit stores this summer. The Nike sneaker features artistic pattern with hints of inspiration of the Nike Roshe. The sneaker was recently seen in the Uncle Drew colourways however, the new edition features an eclectic midfoot overlay design, contrasting white base an moulded spine heel. The sneaker is fitted with white flat Nike shoelaces. 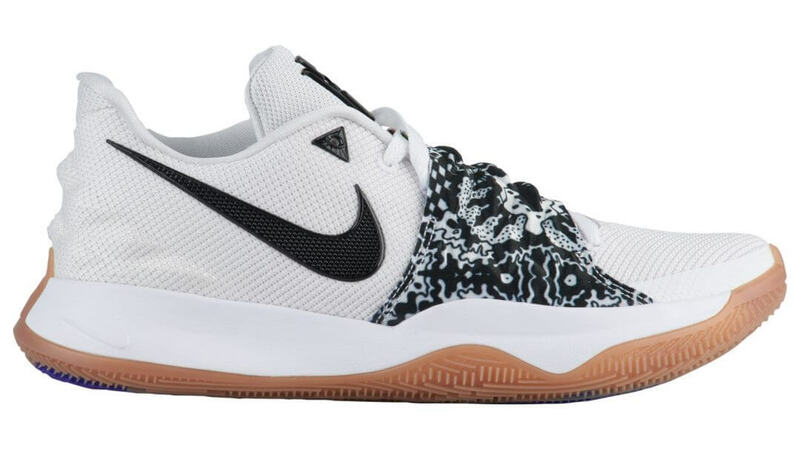 The graphic print to the front of the trainer is main the feature of shoe aside from this we find additional hints of black on the lateral side Swoosh and Kyrie Irvings insignia on the tongue. The gum outsole adds a subtle retro summer vibe to the sneaker, when turned on its side reveals a tricoloured bulls eye detailing. The sneaker is set to be priced at £90.00. You will be able to find the trainer at selected Nike basketball retailers from July 15th.